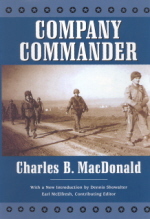 Company Commander by Charles B. MacDonald and "The Maps of Company Commander, Europe 1944 & 1945" by Earl B. McElfresh. A textbook account of soldiering that is nonetheless as exuberant, observant and impressionistic as a classic picaresque novel, with a few stage directions thrown in for good measure. 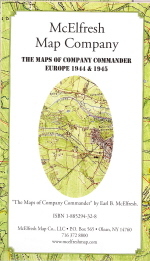 A separate sheet containing eleven maps, specifically designed to illustrate the action of Company Commander, is packaged in a reusable plastic sleeve. The individual maps on the sheet are keyed to relevant chapters of the book. Map scales vary from 1"=350 miles to 1"=ï¿½ mile. Overall sheet size is 37" x 25". Company Commander and Map Set a Main Selection of History Book Club, and a selection of Book- of-the-Month-Club, Military Book Club and The Compass Book Club.